We contemplate, analyze and even fall in love with works of art, but encountering them in sterile museum settings, away from their original locations, original intent, something vital of their true essence can get lost. Especially when trying to recreate a narrative about people and events from four centuries ago involving the most sacred of subjects "feeling the love" can be quite challenging. Zurbaràn’s Crucifixion however, is such a phenomenal painting that it can enchant a viewer despite differences in religion, culture, geography even centuries. Zurbaràn’s life and career coincided with a time when the Catholic Church and its various religious orders were the main patrons of the arts in Spain. What had started in the sixteenth century with the Catholic Reformation to reassert the doctrine, structure and social role of the Catholic Church in response to the threat of Protestantism had resulted in utilizing art, (the Archbishop of Westminster Vincent Nichols so aptly refers to as) “…an invitation to faith." The religious orders commissioned works of art with a didactic intent focusing on the history of the order or the exaltation of its founder or significant members. Zurbaràn excelled in capturing the spirit and the distinctive features of so many religious orders’ sacred images that he became known as the ‘painter of monks.’ Only one year after his first commission in Seville, Zurbaràn painted Christ on the Cross (The Crucifixion) for the oratory of the sacristy of San Pablo el Real. The Crucifixion was the first of many paintings that placed him among the cannons of Spanish Golden Age painting. This magnificent work was the perfect embodiment of the expressive power of Zurbaràn to make the sacred as realistic and accessible as possible. 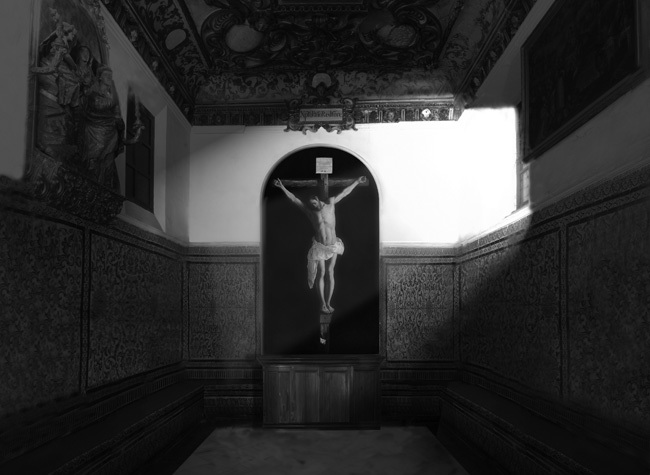 Designed specifically for an alcove in the sacristy of the church, to be encountered in a poorly lit chapel, illuminated only by the light coming from the window on the right, the lone figure of the crucified Christ against a dark background without any distracting narrative is simply overwhelming. The dramatic lighting heightens the sense of reality by pronouncing the details so carefully crafted in the body and the drapery of the loin cloth of Christ. Zurbaràn is actually showing an idealized image of the crucified Christ that deducts the tormented, gruesome details. There is an interesting detail in the iconography that sets this scene apart from its Italian counterparts. Christ is crucified using four nails instead of three which was a subject that was the cause of great debate amongst contemporary theorists. The details of the Crucifixion was one of the exegesis of the Counter-Reformation where it was decreed that painted or sculpted images of Christ on the Cross had to be historically accurate. Francisco Pacheco, in his book, Arte de la pintura cited the earliest images of the crucifixion to corroborate his argument in support of the four nails and his suggestion seems to be the one those who commissioned the painting preferred. As a result of Pacheco's influence, four as opposed to three nails is the representation one finds in Sevillian paintings of this time. The argument of three or four nails concerns the representation of Christ with his legs parallel instead of crossed which can dramatically alter the character of the image. 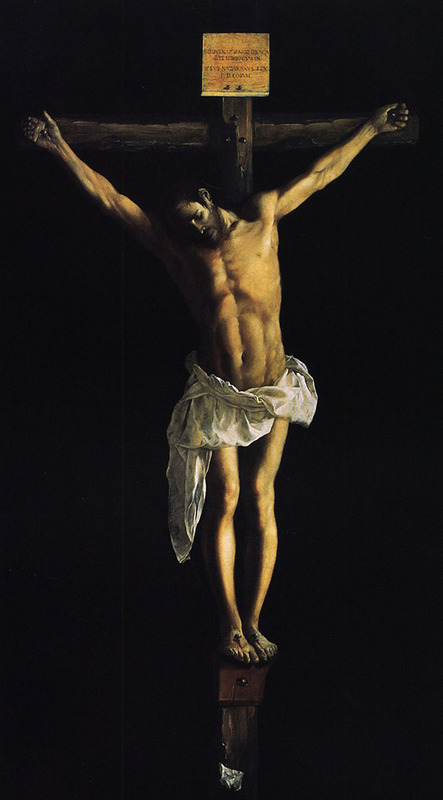 Although it seems as if he is standing Zurbaràn, has managed to show the lifelessness in Christ's body by placing the head fallen towards his right shoulder, outstretched arms and straight legs fixed firmly to the cross. Instead of physical suffering this image suggests introspective agony and resignation. "In the sacristy of the Monastery of San Pablo ... there is a crucifix from his hand which is shown behind the grille of the chapel which has little light. and everyone who sees it and does not know believes it to be sculpture." When I first set eyes on a picture of this painting, I was affected but when I saw a digital simulation of what it was like in situ I was spellbound. It is a powerful image no matter in what context one encounters it but I can't help but wonder what a mystical experience it must have been for the monks who prayed in front of it and encountered it in their daily lives. Seeing a film about an exhibit shown at the National Galley in London two years ago, Sacred Made Real, focusing on the significance and the intentionality of these works of art plus their concurrent relationship to the incredibly realistic polychrome sculptures of similar subjects really brought the whole conundrum into focus. According to the curators of the exhibit, the sculptures were not really known outside of the Iberian peninsula since they never left Spain because they were still part of the spiritual lives of the faithful and venerated at churches, monasteries, during processions. There is another aspect to this exhibit that calls to attention the role of the art historian and how a curator can "Make the Sacred Real". This exhibit seems to be the great success of Dr. Xavier Bray who communicates his deep love of the art so eloquently that one can't help but be moved by it. With each work of art we get a chance to become more intimate with the past, the people who walked those lands, who prayed in those churches and who created those masterpieces. Sacred Made Real seems to have been an exhibit that not only brought the viewer closer to the people and their beliefs but also what they must have felt. You can get a glimpse into this groundbreaking exhibit in the following videos, first by Dr. Xavier Bray who gives an informal, behind the scenes tour and the second by Andrew Graham-Dixon where we can get closer to understanding and appreciating this esoteric art form from a culture within our midst yet still so far away. Now if only the Art Institute of Chicago was to build a small replica of the sacristy where the Crucifixion used to hang, wouldn't our world be a little bit more exceptional? Thank you for the interesting post Sedef. It is interesting to chart the divergence in Spanish artists' response to the edicts of the Council of Trent. Also fascinating to note the devotion to the sculptural works is still strong in Spain. It was clever of AGD to point out the art historical bias towards protestantism, something which is not immediately apparent, nor often discussed. Isn't it amazing to see so many biases on so many levels, that we are just starting to realize? I am constantly surprised to find out how conservative and aged some theories are. I just loved the fresh perspective Dr Bray brought to something I am embarrassed to admit I would have ignored due to its subject matter. Since for me art involves a personal engagement not just intellectual analysis, I loved the drama and the theatricality of the whole thing. And to think this is still a real part of Spanish believer's lives... taken in this context it makes me wonder what else is out there from other cultures that we are ignorant of! It's very nice to get the reader's opinion, I appreciate it.